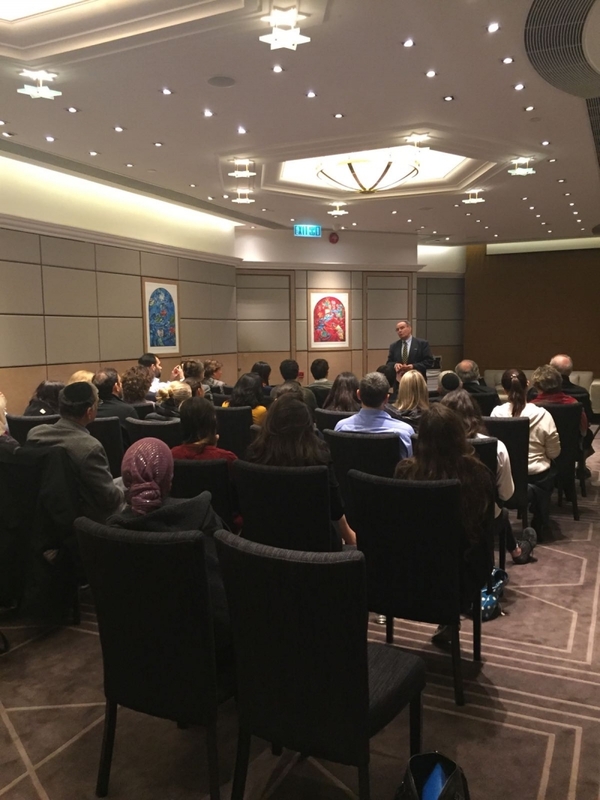 In our joint event with the Jewish Community Centre on 17 January 2017, Micha Gelber, survivor of Bergen-Belsen Concentration Camp, shared his incredible story of survival during the Holocaust. Micha Gelber was born in Ede near Arnhem, the Netherlands, on 28 September 1935. When Micha was eight years old in 1943, his family was arrested and sent to the Westerbork transit camp. From Westerbork the majority of the Dutch Jewish population were deported to Poland to be exterminated, however Micha fortunately found himself on a list of prisoners who were to be exchanged for German nationals interned by the Allies. In January 1944, Micha and his family were transported to Bergen Belsen, where they were subjected to work in forced labour detachments for 15 months in the “star camp” (Sternlager), which held those on prisoner exchange lists. On 10 April 1945, just five days before the British liberated the camp, the 9-year-old Micha was sent on a train eastwards towards Theresienstadt and endured a two-week transport on the sealed train before being liberated by the advancing Russian army just south of Berlin.